It is the end of summer. Your skin is likely to be parched from the sun and is in deep need of a mask that will bring it back to life, with hydration, moisturization, brightening and renewing. I have the perfect thing for dry, dehydrated skin. It is the philosophy when hope is not enough gel-oil mask. It renews skin for a healthy looking glow. If your skin is dry, dehydrated and just all around in need of some TLC, use this mask to help bring it back to normal. It is the kind of mask that can be used every day if need be and is great for the end of the day, to leave on overnight for intense use. This intensely hydrating gel-oil formula leaves depleted skin feeling nourished and comfortable, with a smoothed texture that appears naturally radiant and refreshed. It is a very thick mask that when applied sinks right into dry, dehydrated skin and gives it the moisture that it is lacking. In a 2-week self-assessment study 48 women, ages 35-60 used the mask once a day. 83% of them agreed that skin felt supple, velvety soft and look naturally luminous after use. I can definitely agree with them. After I used this mask, I felt like my skin had been brightened and renewed, was more hydrated and had much more moisture in it. To use this mask, apply to dry, freshly cleansed skin. Massage into skin. Leave on for 10 minutes and tissue off excess or leave on overnight for really radical results. I leave mine on for overnight, as I find I get better results that way. Make sure to avoid contact with eyes. After using you will find your skin is much softer, has more moisture and is not as dehydrated, looks brighter and rejuvenated/renewed. It can be used every day. I would recommend that at least twice a week for those with dry skin. Mature skins could do three times a week, and dehydrated skins the same. I would also recommend this for normal skin once a week. I really would not recommend this for normal, combination, oily or acneic skins. Those skin types produce enough sebum to protect the natural skin barrier and that holds in the moisture so that skin stays moist and softer. 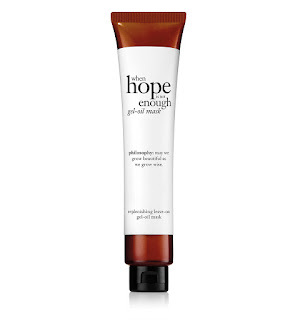 philosophy when hope is not enough gel-oil mask retails for $35.00. It is available online at can be found online at www.philosophy.com and at www.ulta.com. It can also be found where ever philosophy is sold. Like philosophy on Facebook: https://www.facebook.com/philosophy; Follow philosophy on Twitter: @lovephilosophy; Follow philosophy on Pinterest: https://www.pinterest.com/lovephilosophy/; Follow philosophy on Instagram: https://www.instagram.com/lovephilosophy/ and Subscribe to philosophy on YouTube:https://www.youtube.com/philosophy.